We are friends, right? I feel like we’ve become friends over the last 6 months. I feel like we have shared interests, we know what each other likes (giant towering cakes and anything with salted caramel in). We’ve shared tender moments and moments of frustration. Well, we’ve reached a stage where I feel you can trust me, yes? So, just hang in there, this recipe is.. Wait for it..
H-E-A-L-T-H-Y. It has quinoa (key-nee-wah) in. Something a bit mind blowing happened this week. I found out I am a finalist in the BiBs Awards 2014 for Food. One of the final 6. Holy s**t. How did that happen? You know that polite award ceremony face, people saying “oh I am just so happy to be nominated”. I am, I really so am. I didn’t think for a moment that this little blog I started at the end of last year would be that interesting to anyone. I meant to talk about my ups and downs of parenting and now talk way too much about food and how it keeps me sane. Anyway, I just want to say, if you read, or comment, or just look at my photos, or voted, thank you so much. It’s seriously made my day just to be part of something so totally ace. Want to do some dribbling? 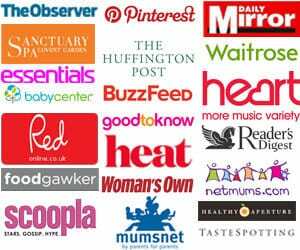 Go and have a look at the other lovely Food finalists, The Crazy Kitchen, My Golden Pear, Elizabeth’s Kitchen, Super Golden Bakes and A Mummy Too. So I should say thanks with cake, right? Oops. Remember, we’re in a trusting relationship? Trust me, this salad is the good stuff. It’s full of super stuff, it’s ridiculously tasty and it’s great to keep in the fridge for lunches. It also makes me a bit less guilty about eating cake for breakfast (sometimes). This is lucky as normally something that takes three pans to make would turn me right off. There’s nothing fiddly though, this is simple and fresh and you should totally make it tonight. Quinoa has confused me since Gillian McKeith went on and on about it 10 years ago. When I went on a yoga retreat was the first time I had it and loved it. The lovely chef there told me her quinoa secret. Basically, you need to toast it in the pan first. I guess like frying risotto rice before adding liquid? I find it makes a massive difference. Also, making sure that the cooked quinoa can sit in the pan, covered for at the very least 5 minutes, makes it fluff up perfectly. What makes quinoa so special? It’s gluten free, easy to digest, a complete protein and high in fibre. It’s nutty bite when cooked properly is totally moreish. 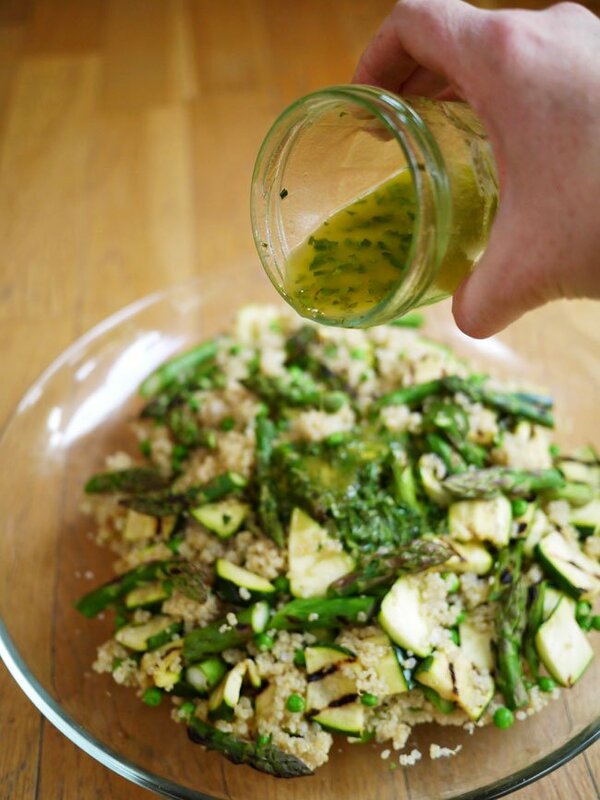 I’ve used asparagus as it’s in season this month and tasting amazing. Don’t bother if it’s out of season, it’s always a disappointment. If you want to make this any other time, you could use chopped ripe avocado instead. Avocado makes everything instantly brilliant in my opinion. When you can fit into your BiBs Awards ceremony dress, you can thank me later..
Rinse your quinoa thoroughly in a sieve until the water runs clear. 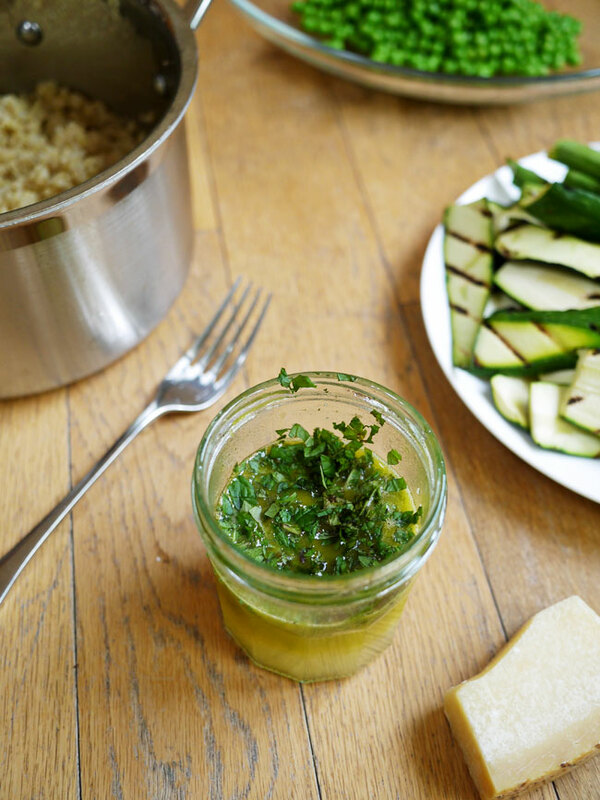 Put your oil into a saucepan over a medium heat and fry your quinoa for 5 minutes. Add the stock and boil for 20 minutes. 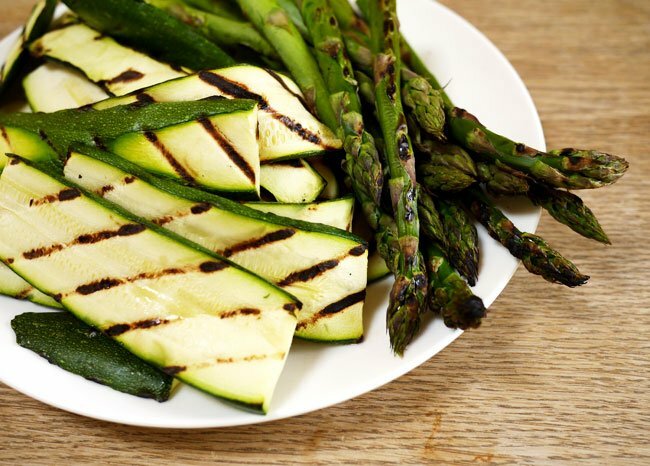 Meanwhile, thinly slice your courgettes lengthways and trim your asparagus and griddle them all for a few minutes on each side until soft. 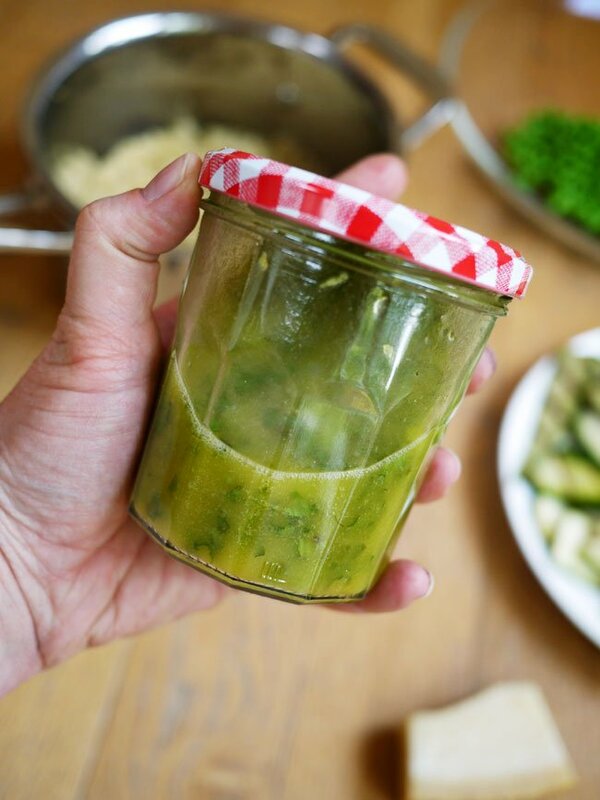 Make your dressing by mixing all of the ingredients together and whisking well or shaking in a jam jar. Cook the peas in boiling water for 3 or 4 minutes and drain. When the 20 minutes is up, switch off the heat and leave the lid on the quinoa saucepan for 5 minutes. Fluff with a fork. 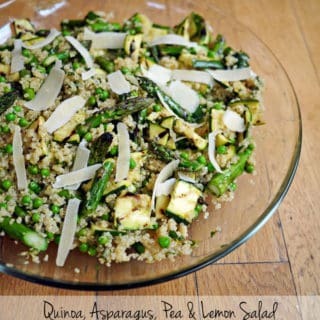 Roughly chop the courgette and asparagus and mix with the quinoa, peas and dressing. Serve with shavings of Parmesan cheese. Thank you, thank you, thank you again dear friends. Can’t wait to see what the next 6 months brings. 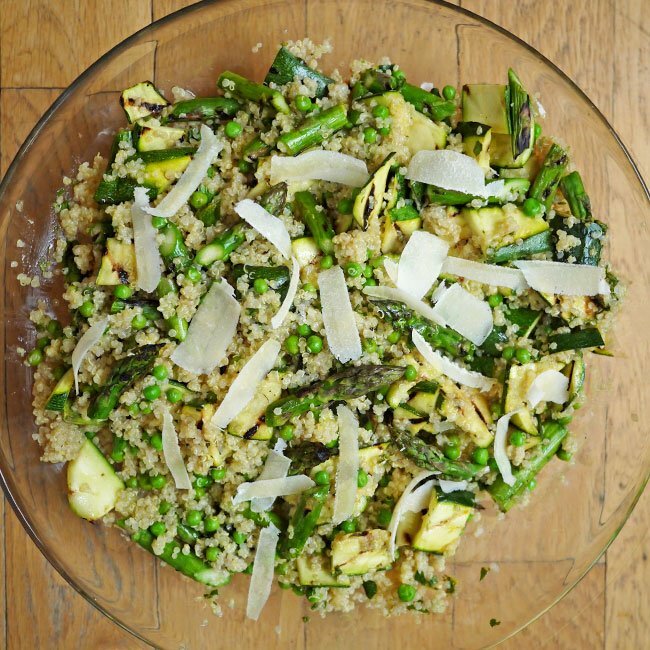 Quinoa, love or loathe? Discuss! This looks absolutely delicious. I’ve always liked the idea of quinoa, but I find it needs rather a lot of attention to make it taste good. I’ll definitely be trying this, especially the toasting first! This looks utterly delicious. I’ve always liked the idea of quinoa but I find it needs a fair amount of attention to make it taste good. I’ll definitely be trying this, especially the toasting first! I have recently discovered Quinoa too and despite being a massive carboholic I am convinced that it can replace rice or pasta. As for the rest of the ingredients, delicious! And I agree re asparagus and its replacement when it’s out of season. Massive congratulations on being a BiBs finalists, that’s just brilliant! 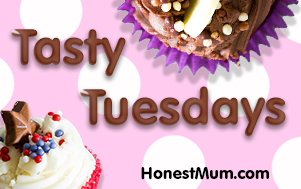 Thanks for linking up to #TastyTuesdays, I have pinned this recipe to the Tasty Tuesdays Pinterest board. 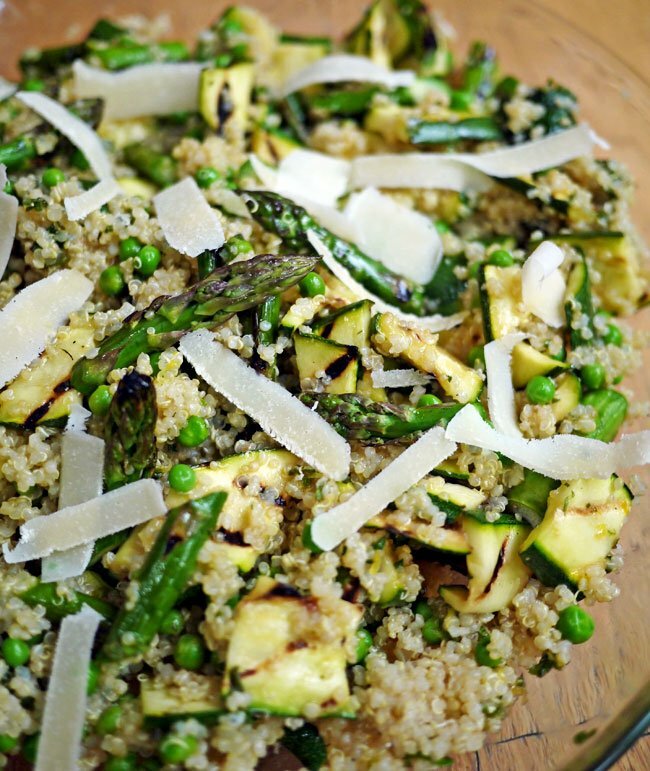 This quinoa salad looks fantastic!! 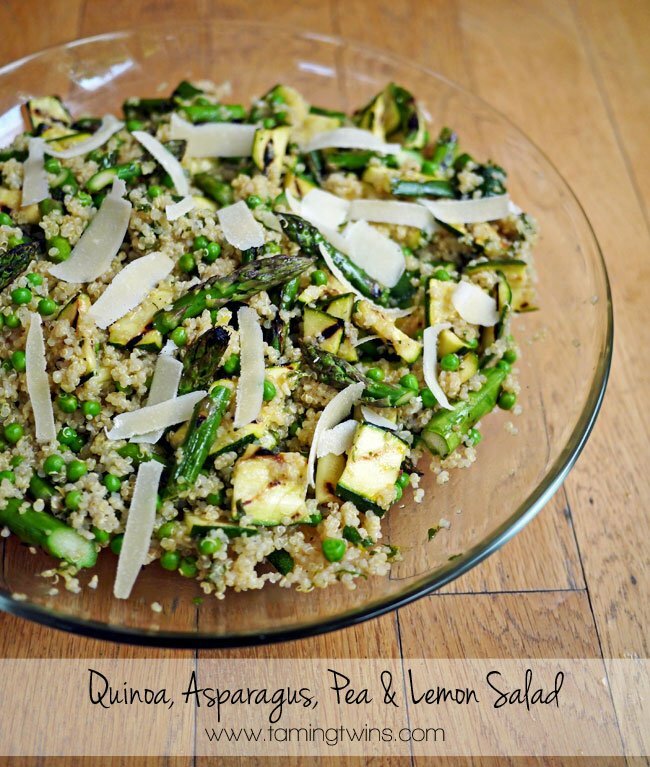 I love all the green veggies in it 🙂 I’m a big fan of quinoa – I was a little wary at first (or rather, uncertain that I was cooking it properly), but I’m a huge fan now! Wow Sarah this looks truly amazing! Such a gorgeous salad recipe and packed full of so much good stuff, am so bookmarking and making. Beautiful pics too. And well done on getting to the finals, go girl. Lovely to meet you at Food Blogger Connect too!